I’m happy to report that Father Pat has recovered and looks great and continues his concert series and work at the shrine. The annual lighting continues each year between Thanksgiving and the Sunday before Little Christmas in January! Please visit La Salette any time during the year — you will be very happy you did. Published in the Foxboro Reporter, The Attleboro Sun Weekend Magazine, The Boston City Paper, Foxborough Patch, and Attleboro-Seakonk Patch. Photos in this post by Robert Gillis unless otherwise noted. “We talk about a world that’s in turmoil. But here at the National Shrine of Our Lady of La Salette, we see so many families with children … their concept of Christmas… this is what Christmas is all about — people coming together here at La Salette to experience the spirit of Christmas.” — Brother Bob Russell, M.S., Shrine Director. The National Shrine of Our Lady of La Salette in Attleboro has something of an identity problem. Either you know it well or not at all, there is no in-between. On one hand, La Salette is well known to many people around the world as a destination for pilgrimages, and to more local residents for masses and other religious devotional services, workshops and programs. And of course, La Salette is renowned as the place with all the Christmas lights. Now, the initial impetus for this article was a feature about La Salette’s Christmas lights and their drive to go all LED. But it became much more than that. In my research and interviews for this piece, La Salette surprised even me — and I thought I knew it. La Salette offers far more than anyone can imagine. At its core, it is a place of serenity, love, community, faith and healing. There, you will find a group of compassionate and kind staff members who will lend an ear, help you, or just smile as you enjoy the lovely holy grounds. La Salette is a hidden treasure and source of hope for which my wife Sue and I share a great love. She’s been visiting since she was about 12; our visits as a couple started in 1990 and have evolved into visits during all seasons to a place that occupies a special place in our hearts. It is my sincere hope that this article will open your eyes and enlighten you to come and experience what we have been experiencing at La Salette — a place of hope. I hope you will see that La Salette is truly a place for everyone to visit — your religion and faith (or lack of it) makes no difference. I encourage everyone to visit for the peace and serenity and healing you will get by just walking in the holy grounds, and please note, there is no entrance fee; it’s free all year-round. 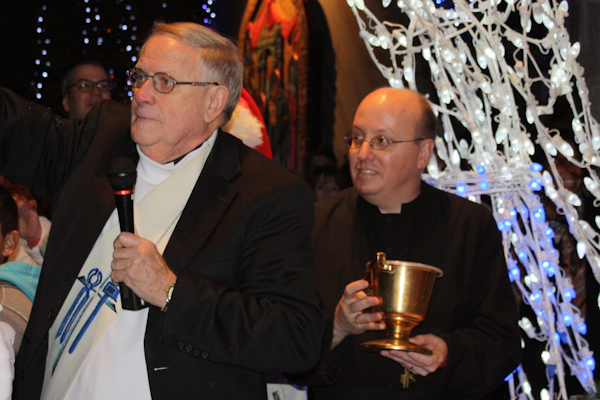 “La Salette — it’s not just Christmas lights.” — Father Richard Delisle, M.S. La Salette is many things to many people. 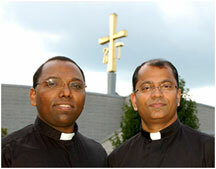 Yes, it is a place of reconciliation first, a destination for retreats held at the retreat & conference center, directed by Father Cyriac Mattathilanickal, M.S.. There are many retreats for adults and youths, and retreats in different languages — Portuguese, Spanish, Filipino, and Vietnamese — are available. There are also bereavement retreats. The sacrament of Reconciliation is available daily. 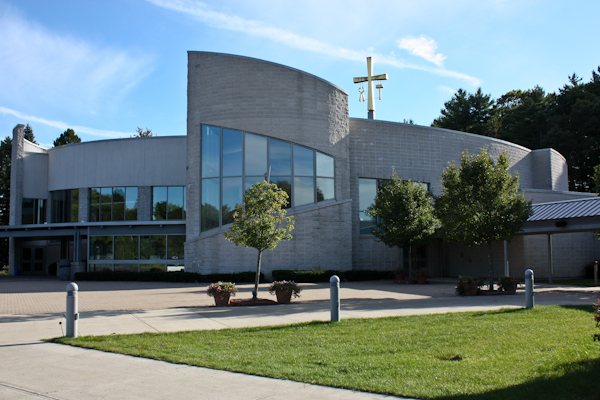 La Salette is a place of prayer with daily rosary and masses, healing services in different languages, multicultural celebrations, 14 ethnic pilgrimage days, youth ministries, young adult ministries, prayer groups, and days of recollection, spiritual direction, music concerts, and guest speakers. There is a soup kitchen ministry, run by Brother Roger Moreau, M.S., feeding 120 people every Monday. La Salette also invites people to enjoy family events such as the carnival with rides and games, farmer’s market, circus, car show, and much more. Did you know that this holy place has 104 acres of natural beauty with its flowers and trees for all to enjoy? Now you do! La Salette also helps in the local community by opening up their facilities during hurricane emergencies, where the Red Cross is able to station their supplies for local needs as well as use for temporary shelter. Brother Bob also loves to talk about the history of La Salette, the many people he credits with its success, and then he makes a joke or two. I keep reminding him how he needs to tell the public how they can help him go LED. We talk about that for a bit before he tells us about another aspect of the shrine we didn’t know, or about another benefactor or volunteer who makes a difference at La Salette. So for me, I finally have to remind Brother Bob that while he’s giving me enough material for a really good book or three, I need to keep things focused on the LED topic. Good luck to me with that! We talked a lot this autumn. We talked about the great goal Brother Bob has for the shrine to “go green” by converting the Christmas lights to all LED in the next few years, hopefully by 2014-2015. We also talked about so much more, and I came to appreciate La Salette as never before. “I do Christmas lights,” the soft-spoken Brother explains. I take care of the flowers [around the shrine].” And the Chapel of Light with 3,000 candles? “That’s my baby.” At that gorgeous chapel, he makes sure all candles are properly lit and all the memorial enrollments continue glowing as requested by donors. g barrels. 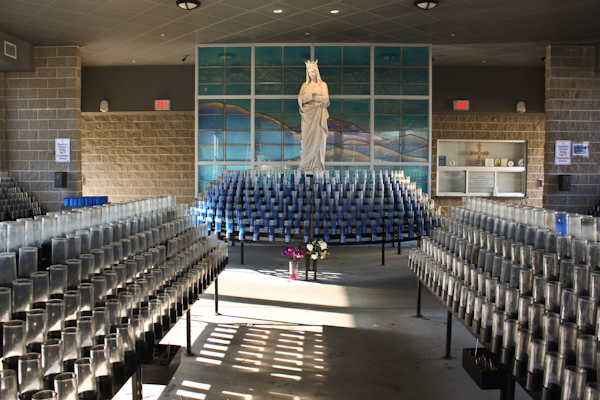 It was interesting to see the sheer volume of recycling and candles — just another peek at behind the scenes at what a complex andimpressive operation La Salette is. 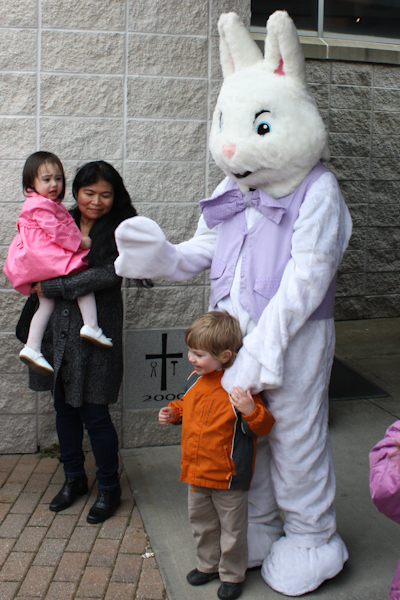 Many others make a difference at La Salette. There’s Brother Lou Brodeur, M.S., the shrine’s jack-of-all trades, who’s responsible for the shrine electronics (such as the microphones and sound systems). Brother David Eubank, M.S. is the shrine publicist as well as Young Adults Ministry coordinator. He is a great asset to Brother Bob and the shrine. Brother Dave is always cheerful with all incoming calls, answering all questions promptly about the shrine’s services and events. Brother Ron Taylor, M.S., is well known as the shrine’s volunteers coordinator (and does much more!) and the La Salette community’s purchasing agent. Brother Ron also found the live donkey who represents “Clopper the Christmas Donkey” throughout the Christmas season. 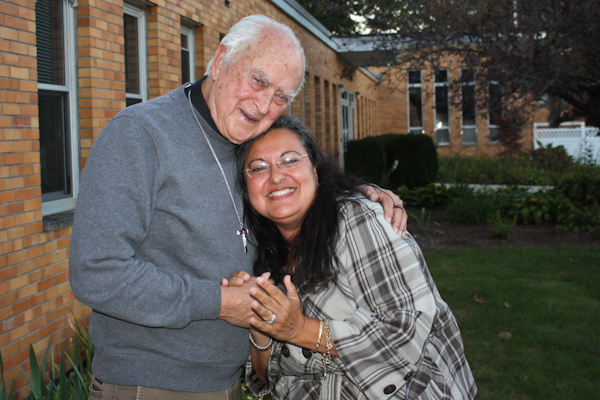 Brother Ron has grown very fond of “Clopper” and gives him lots of TLC while he stays at La Salette! At the end of each evening you will see Brother Ron gently guiding Clopper back to his shelter. 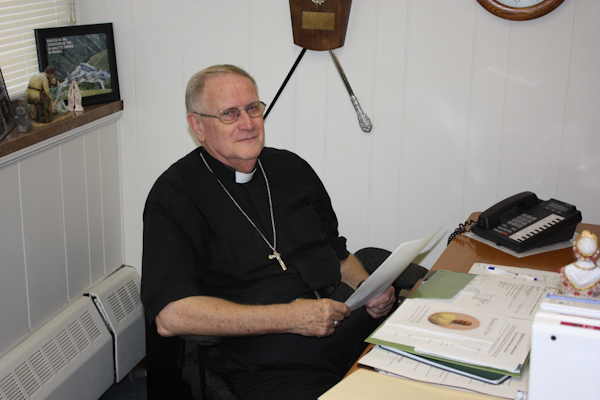 Brother Bob’s assistant is Father Tom Puthsseril, who also works at the retreat center, another tremendous asset to La Salette. They also have the La Salette Sisters, who do a variety of ministries at the Shrine. From Liturgical ministry to the Gift Shop, all who come are greeted with a smile. And during our visits, we often spoke with Father Richard Delisle, one of the priests who remembers how it all began when he worked with shrine founder Father Rene Sauve, M.S., back in the day. I loved those inspiring words. As we spoke in Brother Bob’s office, Brother Bob asked Sue why she comes to the shrine. Sue talks about the peace, sitting quietly in the presence of God, and how she feels so much better when she does this. Then, Brother Bob goes on to compliment Sue for the great job she did at the Tomb of the Resurrection of Jesus early this year. Sue took an interest and worked to clean, paint and restore the statue of Jesus, patch holes, and get a local glass company to build a new glass casing, and she and a friend installed it. It made many people very happy. To make that magic happen on time involves a lot of effort and work before Thanksgiving when the switch is “turned on” and this year’s, “DESCENDING DOVE” Festival of Lights begins. 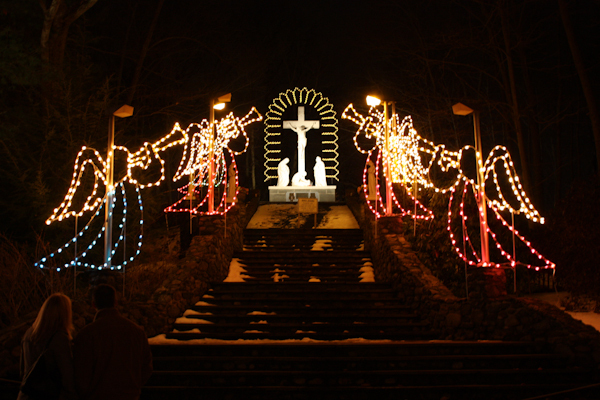 You see, what started in 1954, when La Salette’s founder, Father Rene Sauve, M.S., envisioned a modest light display, is now a dazzling panorama of 350,000 gorgeous lights illuminating La Salette over 46 nights. It is an incredibly beautiful sight — and the effort to make it actually happen is staggering. Brother Paul nods. “A lot of people figure you pull the switch, and everything comes out all right.” What people do not understand is that Brother Paul and his small team of Brothers, maintenance staff and volunteers start the Herculean project in late August, and it will take them about 10 weeks to get everything ready, long before those 350,000 lights come on. In fact, by mid-September, that construction was already VERY evident. And I get to thinking; I just wish I could name everyone and what they do here. The mention of the nuns inspires Brother Bob to tell us about the legendary Sister Gertrude Gaudette, a Dominican nun, who Brother Bob describes as, “Retired, but rewired,” a woman who going is strong at the age of EIGHTY-SEVEN and teaches art to 40 children. An artist who took a hands-on approach at La Salette, not only creating outdoor decorations and painting the lovely “Creation,” “Saint Nicholas,” and the “A to Z” Christmas story boards. Years before, Sister Gertrude was well known for climbing 16-foot ladders in the hottest days of summer, getting her hands dirty and doing the hard work to create and set up Christmas displays. Sister Gertrude is just one of many unsung heroes who create the magic at La Salette. For example, Bob Roy, from BB Metal Art in Enfield, NH designed the metal art displays. Brother Bob talks next about the late Al Lapierre, an artist and a designer. “He designed a lot of icons here that you see every year. Al died five years ago, God rest his soul. Al gave his time, his energy, and his spirit to Our Lady of La Salette and the community.” Brother Bob and Brother Paul described Al as humble, who never missed a daily mass, a man they dedicated their museum to in his memory. In addition to the icons, Al created the St. Francis Garden and countless displays for the Christmas Festival of Lights. Al also built the tabernacle at St. Joseph’s Church in Attleboro, and designed many, many artifacts. His first project was the gorgeous latticework adoring each of the Stations of the Cross, which I personally consider synonymous with La Salette. Al is not only the late benefactor of La Salette. Brother Bob relates stories about people whose lives have ended but whose legacy lives on. One very young man, who died tragically, bequeathed a collection of 400 gorgeous icons that depict various saints. They will be displayed in the new icon museum this year. Then there is Mr. Dugan of Wisconsin. He will donate 412 crèches to La Salette, to be added to the already incredible international crèche museum, which has many hundreds of crèches from around the world. And finally, Dr. Alex Peloquin, a composer and director, passed away, and part of his estate left funds to La Salette specifically for a new organ, which the shrine church so desperately needs. To me, in each case, out of the sadness and the loss, these people, their legacy continues. People pass in and out of life here, but life itself and La Salette’s mission lives on. During this Christmas season the greatest concern is the cost of electricity — about $40,000 for 46 nights of lights. Reducing the cost of this bill is paramount. As Brother Bob explains, going all LED will reduce this cost to a far more manageable and reachable $8,000 for an event that brings 250,000 (yes, a quarter million!) people from around the world to see the lights over that seven week period each year. It’s a laudable goal, from not only the cost-savings standpoint, but part of the “going green” effort as well. But converting to all LED is a huge effort. Brother Paul elaborates, “The greatest challenge will be the big tall trees along the Stations of the Cross walkway.” These are commercial grade $8 bulbs and the cost for all of these bulbs would be around $80,000. But that will be later in the final stage; right now the goal is raising at least $70,000 to convert all the lower lights near the ground to LED lights. And it’s worth repeating because the figure is staggering: When La Salette goes all LED, the electric bill for the Christmas Festival of Lights drops from $40,000 to $8,000! 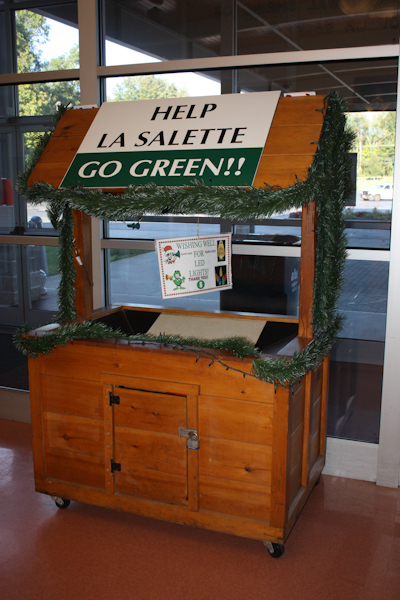 Yes, returnable bottles and cans are a VERY big deal at La Salette — Brothers Bob and Paul have been efficiently collecting and redeeming cans and bottles for years, and they have redeemed a LOT of them. And Brother Bob makes it clear — he’ll root through the trash to find them — he’ll get his hands dirty; he wants those bottles and cans. 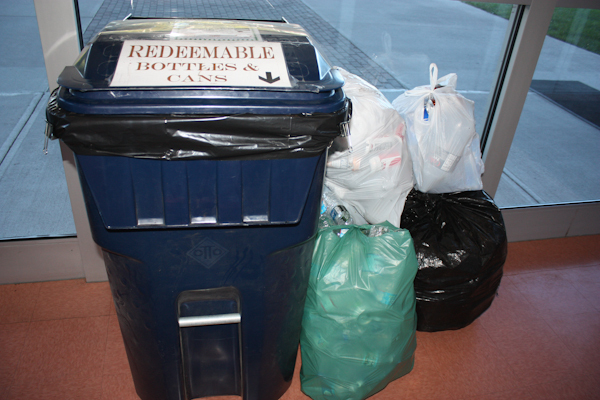 When you come to La Salette, bring your redeemable cans and bottles and drop them off at the bins located around the shrine. “We call it, “Cans & Bottles for LED.” This has been a great success. We have gotten lots of cans and bottles! We are very grateful to everyone who is helping the shrine,” Brother Bob says. One can at a time, one bottle at a time, they’re raising funds for La Salette’s LED effort AND helping others get dialysis. Incredible. You’ll never go hungry at La Salette. They have an excellent bistro, as well many booths to get food. Brother Bob adds that La Salette goes through many pizzas a night, along with selling hot chocolate, hot cider, bread, and the famous French meat pies. You get fed, and your purchase helps the shrine. And of course, you could buy a stuffed “Clopper the Christmas donkey” as a souvenir. But all the fundraising decisions are difficult for Brother Bob — he is a paradox. The shrine needs the donations to survive, but he seems to loathe to come out and ask, and is adamant there will never be an entrance fee or a parking fee on his watch. There’s so much: The fundraising, bottle and can collections, and the Annual Appeal (they have a small booklet depicting all ministries of the shrine). The shrine is also in the process of selling an unused property across the street from the shrine, on the condition that the area be used only for homes and never a business. “It’s all about meeting the bottom line, paying the bills, everything,” Brother Bob adds. My friends, this article, which began as an idea for a modest piece about the LED goal for La Salette, has become so very much more to me. It’s been months of conversations, writing and rewriting and rewriting, a labor of love. It was such a great pleasure to be able to have these conversations with Brother Bob, Brother Paul, Brother David and Father Delisle, and meeting and talking to so many other people. I want to encourage everyone to discover the beauty of La Salette. If you know about it, please tell others, and if you have not been in a while, now is the time. Come see the Christmas lights, take some time to learn about La Salette and all that La Salette is offering to you. You’ll feel it — there are graces waiting to be showered upon you as you step into these holy grounds of La Salette. You will be amazed. I always am. I also encourage you — if at all possible — to make even a small donation when you visit. But if you can’t, please, please visit anyway and see this “healing environment of beauty, peace, and prayer.” You’ll see what a hidden gem it really is, why we love it so much, and all the good work done there. And if you can help La Salette in any way, all the better. Nothing would make me happier than seeing this beautiful place thriving for generations to come. You can help make that dream a reality. 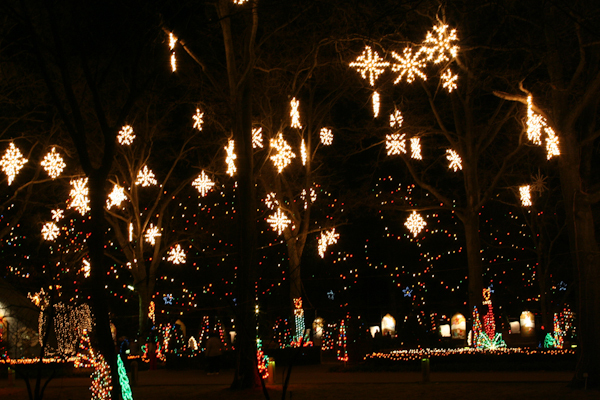 La Salette’s annual Christmas Festival of Lights runs annually from Thanksgiving until the Sunday before Feast of the Epiphany (Little Christmas), with illuminations from 5:00 pm to 9:00 pm daily. There are $5 narrated trolley tours, carousel rides, concerts, nearly 500 Nativity displays, “Faces of Jesus Exhibit”, the Icon Museum, Saint Brother Andre Bessette, CSC museum, food and much more. You can visit their excellent website http://lasaletteattleboroshrine.org/ for much more information or call (508) 222-5410, and visit at 947 Park Street, Attleboro. Authorship note: Although Robert Gillis is the sole author of this article, Brother Bob Russell and his staff provided some very specific guidelines on certain wording. Therefore credit must be given to Rev. Brother Bob Russel, MS and his staff for their contributions to the specific wording. My very special thanks to Father Richard Delisle, MS, and Brother David Eubank, MS, for the great talks, continued inspiration, and a lot of wonderful stories about La Salette. Fun with Facebook: Christmas 2015 edition! I haven’t been for a few years, I’ll make sure to get there this year!